Mention the words Yamaha generator to people, and they’ll equate it with quality. You may have seen Consumer Reports ranked the Yamaha 2000 inverter generator as a quality recreational generator. It ranks well for reduced noise, power quality, and power delivery. For years, Yamaha has manufactured a number of high quality inverter generators that pack power in a small package. If you’ve been using these products before, you’ll have a good idea of what to buy. If not, here’s a guide to the best that Yamaha Generator has to offer. Here you’ll see their specs, features and what separates them from the rest. You can compare and contrast the models and what they offer as well as read customer reviews. Most of the Yamaha generators available on Amazon have FREE SHIPPING . This will save you the trouble of getting one of these home as they are heavy. Honda Generator vs Champion Generator vs Yamaha Generator – Which is the Best? Here’s everything you need to know about generators with a focus on Yamaha generators. Many people, homesteaders and preppers in particular, also consider the option of a solar backup generator. The Yamaha generator Inverter 1000 epitomizes the power and portability that Yamaha 1000 generator has become known for. Unlike other generators, the Yamaha Generator Inverter provides power and electrical output without compromising portability, which has always been one of the biggest concerns for consumers. Yamaha 1000 generator Inverter (Check prices here) has a specially designed inverter system that allows it to produce up to 1000 watts of power. Once the generator is up and running, you can use it nonstop for up to 12 hours without the need to fuel up again. The Yamaha 1000 Generator Inverter also uses Yamaha’s fuel efficiency system so it lasts much longer. Yamaha 1000 generator also distinguishes itself from others is the way it delivers clear and superior quality power. The Yamaha Inverter generates sine waves which is purer power when compared to other sources. Basically, this means when you run the Yamaha 1000 generator, you don’t have to worry about the kind of energy you are using. Just like other generators by Yamaha, the Yamaha inverter Generator 1000 has several modes. When you set it to Economy, you can run it for 12 hours continuously. The unit also has a Smart Throttle Load that allows the Yamaha 1000 to adjust the speed of the engine dynamically. With the Smart Throttle Load, the Yamaha 1000 generator is able to tweak the output according to the requirements, making it even more fuel efficient. The Yamaha Generator also has a dual coil alternator stator that reduces fuel consumption by cutting back engine speed. For all its power and versatility, the Yamaha 1000 Generator only weighs 27.6 lbs, making it more portable than other generators in its class. The control panel is well-designed too as you can access its features with a single button. Because it can recharge via its 12V DC output, you can use it on boats, cars and RVs. The Yamaha Generator also has a noise reduction feature built in so you can run it without having to put up with excess noise. The glass wool used in its construction acts as a natural sound absorber. The noise is minimized, even when running at full power. The Yamaha generator 2000 (Check prices here) is equipped with a 79 cc 4-stroke OHV engine, and judging from the built and cast iron cylinder, it’s built to last. Performance-wise, the Yamaha 2000 generator delivers in terms of dissipating heat especially when ranged against other generators in its class. With a maximum output of 2000 watts, the Yamaha generator 2000 is also equipped with the Pulse Width Modulation (PWM) control from Yamaha. It’s this feature that allows the Yamaha generator 2000 to produce clean sine waves. Even if you don’t understand all the technical details, what’s important to note is that it’s this purity that allows it to operate air conditioners, refrigerators and other electronics. Yamaha 2000 watt generators are most ideal for powering up a couple of essential appliances. If there’s a power outage for instance, you can use the Yamaha Generator to power a good sized refrigerator as well as a pump, some lights, or a host of other small appliances. The Yamaha generator 2000 comes with a 1.1 gallon tank which handles regular unleaded. This tank seems small but in spite of this, it’s capable of operating for 10.5 hours straight with a 25% load. The unit also has an impressive design: a pull start mechanism is utilized and will start with a single pull. Yamaha generators 2000 from Yamaha are known for being quiet and the Yamaha Generator is no exception. When running, the Yamaha Generator has a noise level of 51.5 dB to 61 dB, and that’s quiet any way you look at it. 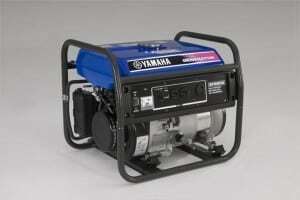 Because of this, and its reliability, the Yamaha Generator has become one of the most widely used generators for camping. The Yamaha generator 2000 has a dry weight of 44 lbs. and measures 19.3 in long, 11.0 in wide and 17.9 in high. This means it only takes up 2.2 cubic feet, making it much more compact than most generators. The Yamaha Generator has a good warranty as well. It’s good for three years and covers the entire unit. Another reason this generator is worth considering, is its number of 5 star ratings in customer reviews. It’s easy for a manufacturer to say that their product can do this or that, but when you get confirmation from customers, then it’s another story altogether. Any way you look at it, the Yamaha Generator 2000 offers good value for your money. The Yamaha generator 24000 (Check prices here) has several features that more than justify its price tag. Compared with the other generators by Yamaha, the Yamaha 2400 Generator has a more powerful motor and is capable of providing clean power. The controls for Yamaha Generator 2400 have also been simplified so it’s easier to run. It can make adjustments to the engine speed to correspond with the load. This is an important feature as it helps conserve fuel and energy. The Yamaha Generator also has a built-in safety feature that prevents possible damage to the engine when oil is running low. With the way the unit has been constructed, expect it to last, which will alleviate concerns about down times or repairs. As far as performance is concerned, the Yamaha Generator 2400 can handle air conditioning systems, blow dryers, microwave ovens and other appliances. The Yamaha Generator 2400 has a fuel gauge so you see how much is left, and as one of Yamaha’s High Current models, it is built to last and is made for heavy duty use. These generators also have an aluminum die-cast frame, and because the TCI rotor is aluminum as well, it makes the Yamaha 2400 Generator compact and light, weighing 75 lbs. Yamaha Generator 2400 also has the Pulse Width Modulation (PWM) found in other Yamaha generators. This produces high quality electrical power. When you run the Yamaha Generator 2400, you can use it with confidence on your sensitive electronics. If you need to make adjustments to the configuration, the Smart Throttle feature will do it for you. What all this means is the Yamaha Generator 2400 runs quietly. When at full power, it can run for 8.5 hours with a ¼ load capacity. In addition, Yamaha Generators 2400 have a Watch Warning System which will keep the engine from getting damaged. As far as versatility goes, the generator is very useful when it comes to starting and running electric motors. Just like the other generators featured here, the generator runs quietly and is built for long term use. In particular, the Yamaha Generator 2400 has a solidly built engine and the framing is durable. You will find the controls easy to use, and it has above average fuel consumption. The Yamaha generator 3000 (Check prices here) is one of the most powerful inverter generators available. One of its main features is the Pulse Width Modulation, the same system used by other generators to produce superior quality electricity. When the Yamaha generator 3000 is running, it’s going to generate the sine waves necessary to operate computers and other appliances. One of the more common problems with generators is they produce a lot of noise. However, with the Yamaha Generator 3000 that’s not going to be an issue because of its sound reduction system. If you examine the enclosure on the Yamaha Generator 3000, you’ll see that it uses sound absorbing elements set in specific locations. Yamaha generator 3000 also has a uniquely designed muffler that keeps the noise down. Just like the other generators featured here, it has a Smart Throttle Load Sensing Throttle Control that adjusts the engine speed so it corresponds to the load it is carrying. What this means is when the generator is running, it makes the maximum possible use of its fuel. The Yamaha Generator 3000 also has an Oil Watch Warning System that will notify you if fuel is running low. More importantly, the Yamaha generator 3000 turns itself off when the fuel has reached a certain point, and you won’t be able to start it up until you add more. With this safety feature built in, you don’t have to worry the engine will suffer damage. The running time for the Yamaha Generator 3000 is 20.5 hours under the Economy Mode with ¼ load capacity. Its 12 volt batteries can also be charged on cars, RVs, boats and even aircraft. When the generator is running, a noise reducer runs along. There’s also a centralized control panel that gives you access to all the options, and there’s an electric starter included as well. The Yamaha Generator 3000 runs very well. It’s not noisy, has a stylish look and the gas gauge is a nice feature. Furthermore, the power used is clean and doesn’t cause any problems when it comes to using different types of appliances. The Yamaha Generator also lets you turn the fuel off with the valve as it’s convenient. It is wise to consider what is the best backup power during outages. This is especially true if you are counting on multiple income streams at your home, as in the case of a small farm, etc. You can call Yamaha customer service and they can decode your engine serial number and convert it to year and model type. Or you can match the serial number on this list. The cost of these Yamaha generators depends on the specs and where you buy them. The Yamaha generator is about $800 on average, while the Yamaha generator 2000 is around $1,000. The Yamaha generator 2400 is more expensive at approximately $1300, but that’s not surprising given its specs. The costliest among the products reviewed here is the Yamaha generator 3000 which retails for $2500 to $2600. A Yamaha generator may be a great investment if you are making a plan to overcome food crisis and are storing meat, etc. These are just meant to give you a general idea of the price of a Yamaha generator because the specific figures will vary depending on where you buy. Also keep in mind that most online retailers offer discounts or free shipping so it’s always a good idea to have a look around different shops and compare the prices with Generac generators as well. Generally speaking though, you cannot go wrong with a Yamaha generator. They are built to work and last.